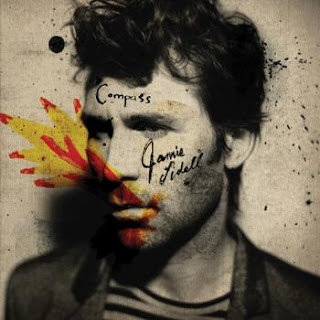 Fans of Jamie Lidell will surely enjoy Compass, his newest release, because it holds onto (and upgrades) a lot of digital effect-driven soul-pop that made him famous with 2005's Multiply. Compass re-raises the stakes after Lidell's more reserved, straightforward presentation on Jim, but for all it brings back in the heavy-beat, crunchy electronic department it also lacks the distinct catches and hooks, and memorable choruses that populated Multiply. Instead, Lidell produces a series of cool (both in spirit and in pace) songs that keep the new album moving forward in a more shoe-gazey way. What made Lidell most desirable, a sort of unapologetic attachment to dance and soul sounds drifts greatly out of the picture, replaced with rock vignettes that don't seem to be in any hurry to reach a goal, or even wrap themselves up clearly or completely. This could be part of the titular compass that Lidell's using to find direction, but at times it seems that the needle is spinning in a magnetic vortex, lost more than stable. Opening with a mostly Multiply-era dance track in "Completely Exposed," Lidell barks with a heavy-distortion musical backdrop that sets a tone of ceaseless grinding, but also exclaims a subtle vulnerability, seeming to say, "This is what you know of me, but things are going to change." It's a great song to start the album off, rooting itself in the previous Lidell canon. But it's followed by "Your Sweet Boom," which has a very similar sound, despite its slowed speed, and is littered with tiny guitar riffs and a distinctly Beck-ish aspect that is clearly due to his hand in the album's production. "She Needs Me" feels like a mix between a classic Al Green track and synth-driven '80s projects. There even seems to be a little hint of The Police in there. And then "I Wanna Be Your Telephone" deviates toward the other end of things, less soulful, more dance, and more glitchy touches. And the repetition of the track's title as a lyric in a whispery tone that doesn't really grab the listener in a tangible way. Really, it's a hit-esque song that misses by using too many extraneous sounds to make up for a lack of lyrical and melodic ingenuity. Luckily, "Enough's Enough" drops back into Lidell's soul wheelhouse by presenting a classic "lover wondering where he stands with his lady" song. The track demonstrates the same repetition as some of the others, but has a little bit of a Jackson 5 quality, multiple vocals and a call-and-response style with bright instruments. It's, perhaps, the best song on the album. Lidell turns to the second third of the album with the bluesier "The Ring," a song about both commitment and being possessed by love. And then the straight '70s grind-rock, "You Are Waking" populated with distorted guitar riffs, and fast, marching drums. Another great song because Lidell succeeds through the experiment vocally by letting the song's tone and heavy production drive it, rather than sing it to success. "It's A Kiss" is sweet, and well done, but less than memorable, and "Compass" is a little too melodramatic. Then "Gypsy Blood" combines, and pretty seamlessly, the R&B vibe with the building rock vibe. "Coma Chameleon" a track co-written by Lidell and Beck, blends their styles thoughtfully. It's a fine song, and yet I'm slightly averse to it simply because of the "Karma Chameleon"-like title. The song doesn't touch on anything Culture Club, and that sort makes it seem self-aware. Like a speed metal band doing a song called "Cashmere" that never even touches on the Led Zeppelin classic of similar pronunciation. "The Big Drift" is a serious treat, though slower, because it blends Lidell with Beck, Leslie Feist and Lindsay Rome in a chorus that's both enchanting and eclectic. "You See My Light" closes the album on a peaceful, quiet, and somewhat sad note for an album that feels all over the place and mostly mid-up beat. So, is Compass a success? Yes and no. For a Lidell fan like myself, it's a great addition to his catalog, but also one that feels a little haphazard. With Beck, and Grizzly Bear's Chris Taylor involved in the production, it feels unclear who possesses the album creatively. Lidell did write the majority of the tracks, but he also appears to be actively pulled in opposing directions. If all of these diverse styles created stellar songs, something big and unexpected, then it would be a whole success, but the album isn't as memorable as past Lidell work, and that's a problem. It's great project, with a lot of hits, but some subtle misses, so Compass isn't a must have, but it is a worthy edition to any Lidell fan's collection, or any fan of soul/R&B/rock fusion. Just don't look for a consistent message.